Traveling to an unfamiliar destination can be stressful because it increases the chance that people will get lost at some point. 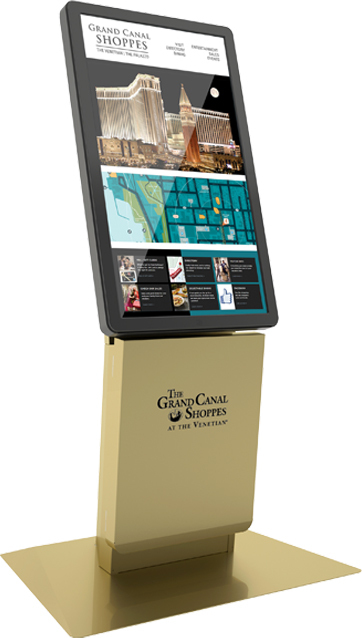 Wayfinding Kiosks can help travelers navigate their way to and around venues including shopping malls, business buildings, business parks, amusement parks, sports arenas, department stores, shopping districts, tourist attractions and restaurants. Aside from helping someone find their way, wayfinding kiosks can also generate revenue in a few different ways for its owners. Certain wayfinding software incorporates an ad scheduler which allows the kiosk owner or administrator to sell ad space to businesses in the surrounding area. Truly intuitive wayfinding software can also make product recommendations or alert a user of a sale that is happening that matches their search criteria. Using various delivery methods like on screen QR codes, text messages, emails, or even physical print outs; a wayfinding kiosk can effectively broadcast loads of information about the user's surroundings. Often times, people will find a type of kiosk called an "e-concierge" in the lobby of hotels. This lobby kiosk can tell guests about entertainment and dining options in the area and even assist in making reservations or purchasing tickets.There are numerous wayfinding software choices, but Olea recommends 22 Miles and Novotouch products.